Browns Removals & Storage - Removals/Storage based in Aylesbury, Buckinghamshire. Browns Removals provide long and short distance home and office removals. Whether you’re moving across town, country or Europe, you can rest assured Browns Removals will transport your possessions, safely, securely and on time! We also have a range of packing options to suit all your removals and storage needs, whether you prefer to be active or sit back and let the professionals do the work. 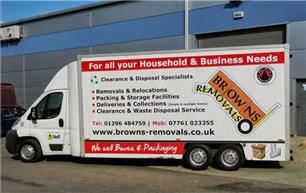 Browns Removals will assist you through the whole of your household and/or commercial moving process. From helping you pack, to supplying all your boxes, packaging materials and even helping to dismantle and reassemble your larger furniture items. We can also provide you with long or short term, low cost storage services for all your needs. We are fully licenced to clear and dispose of any unwanted goods or furniture, whether to be recycled or donated to local charities. Browns Removals were established in the summer of 2006 by Gary Brown. Born and raised in Aylesbury, Buckinghamshire, Gary has been working within the removals industry for over 17 years. Browns Removals pride ourselves in taking great care and attention when it comes to our customers’ individual needs, importantly transporting all possessions safely and securely. We have built up locally a very strong reputation for providing quality services and offering value for money. We have many happy, satisfied customers and local businesses who continually use and recommend our services. Aylesbury, Buckinghamshire, Thame, high Wickham, Amersham, Chesham, Wendover, Beckinfield, Stoke Mandeville, Hemel Hempstead, Bicester, Waddesdon, Oxford, Milton Keynes, Leighton Buzzard.